Skin of sole of foot is hairless and thick. No sebaceous glands are present in it. It shows firm attachment with deep fascia. It shows large number of sweat glands. It is creased and help in grip of sole on the ground. It contains subcutaneous fat in fibrous meshwork formed by irregular septa. Fibrous meshwork connect skin with deep fascia. Superficial fascia thick over some points of sole like posterior tubercle of calcaneus, heads of metatarsal bones and pulp of digits. These are weight bearing points of sole. It is branch of tibial nerve supply skin weight bearing area of sole i.e. posterior and medial part of sole. It is branch of tibial nerve supply skin of medial part of sole including medial three and half toes. It is branch of tibial nerve supply skin of lateral part of sole including lateral one and half toes. It is formed by bundles of collagen fibres longitudinally arranged in sole. Dividing sole into three parts central, medial and lateral parts. Central part is very thick forming plantar aponeurosis. Medial and lateral parts are thin forming plantar fascia. 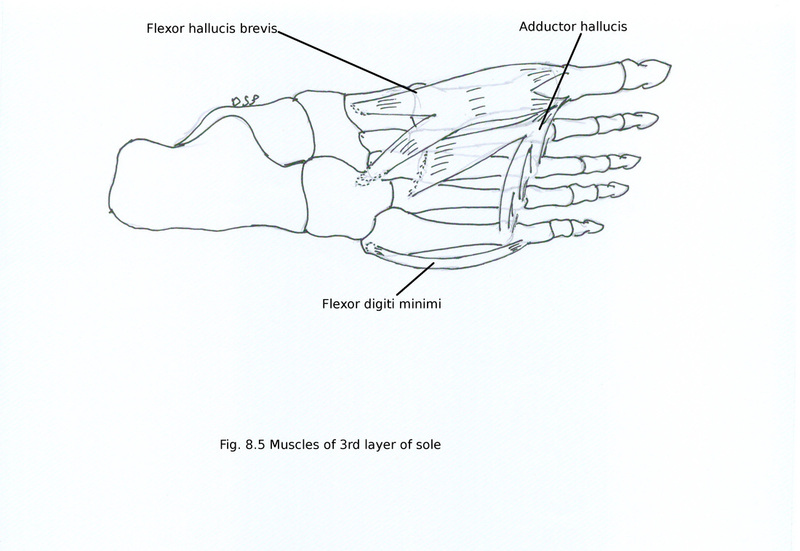 Central part covers flexor digitorum brevis, median part covers abductor hallucis and lateral part covers abductor digiti minimi. It is thick central part of deep fascia. It is triangular in shape and narrow posteriorly. Posterior part shows attachment on medial tubercle of calcaneus proximal to flexor digitorum brevis. Anterior end divides into five bands one for each toe. Transverse fibres held together five bands. Plantar digital vessels and nerves passes between interval between bands protected by transverse fibres. Near head of metatarsal head digital bands divides into superficial and deep slips. Superficial slip shows attachment on skin and blends with superficial transverse metatarsal ligaments. Deep slip divides into two parts which embrace flexor tendons. Then it blends with fibrous flexor sheaths and deep transverse metatarsal ligaments. Lateral and medial intermuscular septa passes vertically from medial and lateral aspect of central part. Transverse septa arising from vertical septa divides muscles of sole into four layers. Medial part of plantar aponeurosis covers abductor hallucis. Posteriorly it continue as flexor retinaculum and medially it continue with deep fascia on dorsum of foot. Lateral part of plantar aponeurosis covers abductor digiti minimi. It continue as deep fascia of dorsum of foot laterally. It fixes skin of sole. It maintains longitudinal arch of foot. It protects vessels and nerves from compression. It gives origin to muscles of first layer of sole. It divide sole into different compartments. These are four fibrous bands connecting plantar ligaments of metatarsophalangeal joints. It lies in between interossei muscles dorsally and lumbricals, digital vessels and nerves ventrally. 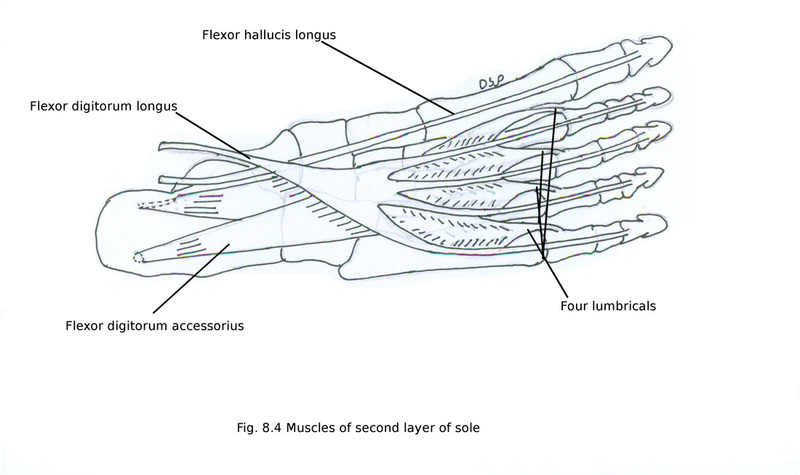 There are four layers of muscles in sole. It is deep to plantar aponeurosis. It is having three intrinsic muscles. Origin : It shows origin from medial tubercle of calcaneus, flexor retinaculum, medial intermuscular septum, plantar aponeurosis and flexor digitorum brevis. Insertion : It forms a tendon joins with tendon of flexor hallucis brevis and shows insertion on medial aspect of base of proximal phalanx of great toe. Nerve supply : It receives nerve supply from medial plantar nerve (S1, S2). Action : It helps in abduction of great toe. Origin : It shows origin from medial tubercle of calcaneus, flexor retinaculum, medial and lateral intermuscular septum and central part of plantar aponeurosis. 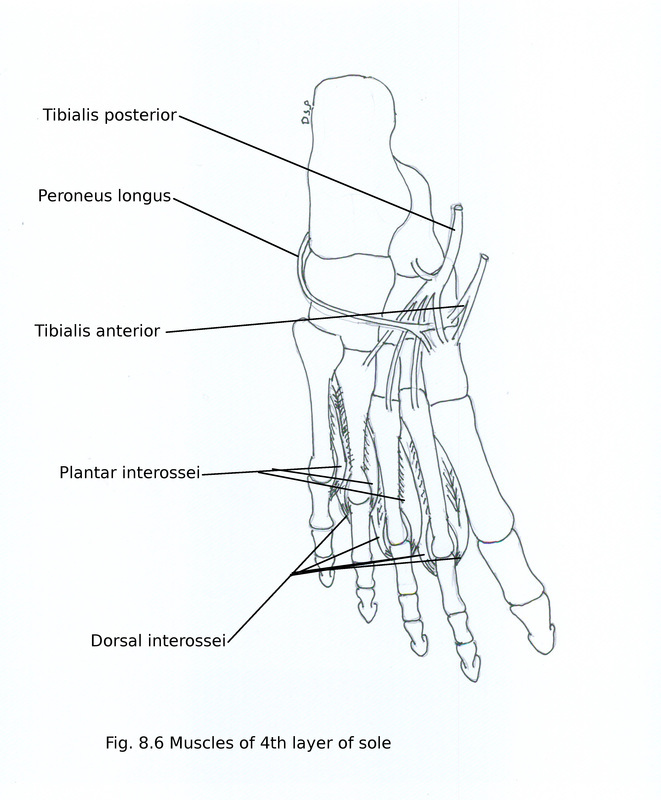 Insertion : It forms four tendons for lateral four toes. It splits into two slips near bases of proximal phalanges through which long flexor digitorum longus tendons passes. Then reunite again after decussation split and shows insertion on sides of middle phalanx. Nerve supply : It receives nerve supply from medial plantar nerve (S1,S2). Action : It helps in plantar flexion of lateral four toes by flexion at proximal interphalangeal joint. Origin : It shows origin from lateral and medial tubercle of calcaneus, plantar aponeurosis, intermuscular septum and flexor digitorum brevis. Insertion : It forms a tendon passes over groove on plantar aspect of fifth metatarsal bone and shows insertion on lateral side of base of proximal phalanx of little toe. Nerve supply : It receives nerve supply from lateral plantar nerve (S1,S2,S3). Action : It helps in abduction and plantar flexion of little toe. It is having two extrinsic and two intrinsic muscles and four lumbricals muscles. After passing deep to flexor retinaculum and abductor hallucis. Passes below sustentaculum tali of calcaneus. Flexor digitorum longus tendon crosses it from medial to lateral side superficially. Then it goes anteriorly on plantar aspect of sole finally shows insertion on base of distal phalanx of great toe on its plantar aspect. After passing deep to flexor retinaculum and abductor hallucis. Flexor digitorum longus tendon crosses flexor hallucis longus from medial to lateral side superficial to it. Then it goes anteriorly on plantar aspect of sole divides into four digital tendons finally shows insertion on base of terminal phalanges of lateral four toes on its plantar aspect. Origin : It shows origin from two heads lateral and medial. Medial head shows fleshy origin from medial concave surface of calcaneus and from medial tubercle of calcaneus. Lateral head shows tendinous origin from lateral tubercle of calcaneus and long plantar ligament. Both heads joins with each other for common insertion. Insertion : Two joined heads shows insertion on lateral side of tendon of flexor digitorum longus. 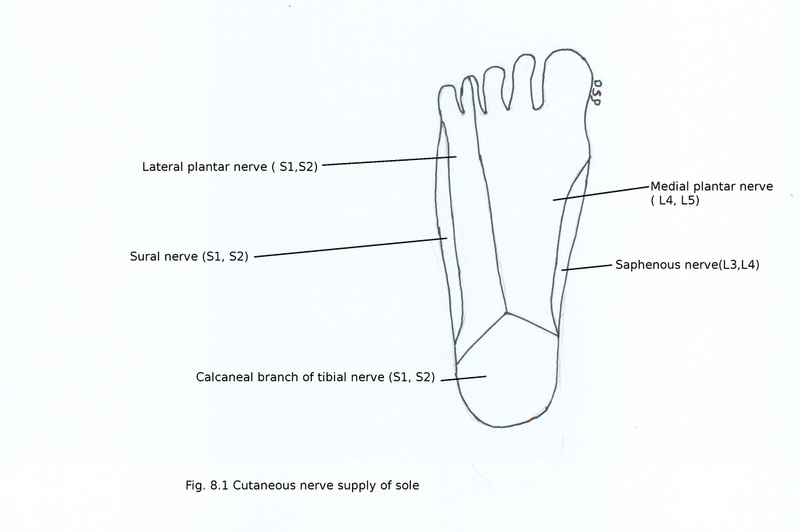 Nerve supply : It receives nerve supply from trunk of lateral plantar nerve (S1,S2,S3). Action : It helps in plantar flexion of foot by changing direction of pull of flexor digitorum longus for lateral four toes. These are small muscles of second layer. Numbered from medial to lateral side. First lumbrical is unipennate and other three lumbricals are bipennate. Origin : First lumbrical shows origin from medial side of first tendon of flexor digitorum longus and second, third and fourth lumbricals shows origin from adjacent sides of tendons of flexor digitorum longus. Insertion : Tendon of each lumbrical passes anteriorly on medial side of base of proximal phalanx of lateral four toes. After joining with dorsal digital expansion shows insertion on base of middle and terminal phalanx of lateral four toes on dorsal aspect. Nerve supply : First lumbrical receives nerve supply from medial plantar nerve and remaining three from deep branch of lateral plantar nerve (S2,S3). Action : It helps in plantar flexion at metatarsophalangeal joint and dorsiflexion at interphalangeal joints of lateral four toes. It is having three muscles one for little toe and two for great toe. Insertion : As it is a bipennate muscle shows two tendons. Medial tendon shows insertion on medial side of base of proximal phalanx of great toe along with tendon of abductor hallucis, lateral tendon on lateral side of base of proximal phalanx of great toe along with insertion of adductor hallucis. Action : It helps in plantar flexion at proximal phalanx of great toe. Origin : It shows two head of origin oblique and transverse. Oblique head shows origin from bases of second, third and fourth metatarsal bones. Transverse head shows origin from deep transverse metatarsal ligaments, plantar metatarsophalangeal ligaments of third, fourth and fifth toes. Insertion : Two tendons joins with each other at an acute angle shows insertion on lateral side of base of proximal phalanx of great toe. Nerve supply : It receives nerve supply from deep branch of lateral plantar nerve (S2,S3). Action : It helps in adduction of great toe. Maintains transverse arches of foot. Origin : It shows origin from plantar surface of medial part of base of fifth metatarsal bone. Insertion : It forms a tendon and shows insertion on lateral side of base of proximal phalanx of little toe in common with insertion of abductor digiti minimi. Nerve supply : It receives nerve supply from superficial branch of lateral plantar nerve (S2,S3). Action : It helps in plantar flexion of little toe. It is having seven intrinsic and two extrinsic muscles. These are present in between metatarsal bones. These are four in number. One to four numbered from medial to lateral side. These are bipennate muscles. Dorsalis pedis artery passes through gap in between two heads origin of first dorsal interosseous and proximal perforating artery passes through gap between heads of origin of other dorsal interosseous muscles. Origin : It shows origin from adjacent sides of shafts of metatarsal bones. First from lateral side of shaft of first metatarsal and medial side of shaft of second metatarsal bone. Second from lateral side of shaft of second metatarsal and medial side of shaft of third metatarsal bone. Third from lateral side of shaft of third metatarsal and medial side of shaft of fourth metatarsal bone. Fourth from lateral side of shaft of fourth metatarsal and medial side of shaft of fifth metatarsal bone. Insertion : First shows insertion on medial side of base of proximal phalanx of second toe. Second shows insertion on lateral side of base of proximal phalanx of second toe. Third shows insertion on lateral side of base of proximal phalanx of third toe. Fourth shows insertion on lateral side of base of proximal phalanx of fourth toe. All four tendons also shows attachment with dorsal digital expansion. Nerve supply : First, second and third dorsal interossei receives nerve supply from deep branch of lateral plantar nerve (S2,S3) and fourth dorsal interosseous receives nerve supply from superficial branch of lateral plantar nerve (S2,S3). Action : It helps in abduction of second, third and fourth toes. They also help in flexion at metatarsophalangeal joint and extension at interphalangeal joints of little toe. These are three in number. One to three numbered from medial to lateral side. These are unipennate muscles. Origin : It shows origin from medial sides of shafts of lateral three metatarsal bones. First from medial side of shaft of third metatarsal, second from medial side of shaft of fourth metatarsal, third from medial side of shaft of fifth metatarsal bone. Insertion : First shows insertion on medial side of base of proximal phalanx of third toe. Second shows insertion on medial side of base of proximal phalanx of fourth toe. Third shows insertion on medial side of base of proximal phalanx of fifth toe. All three tendons also shows attachment with dorsal digital expansion. 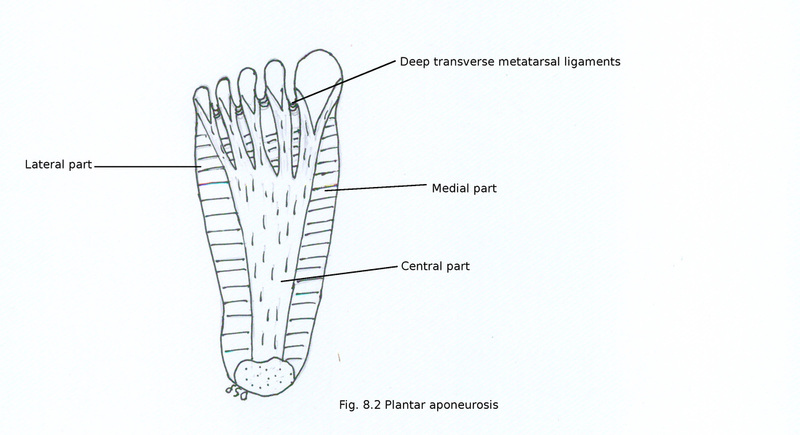 Nerve supply : All plantar interossei receives nerve supply from deep branch of lateral plantar nerve (S2,S3). Action : It helps in adduction of third, fourth and fifth toes, flexion of metatarsophalangeal joints and extension at interphalangeal joints. Tendon of it goes medially and forward in relation to cuboid. After passing through osseo-fibrous tunnel on plantar aspect of cuboid bone shows insertion on infero lateral surface of first metatarsal bone and adjacent surface of medial cuneiform bone, a small slip on second metatarsal bone. Tendon of it shows insertion on tuberosity of navicular bone also shows insertion on all tarsal bones and base of second to fourth metatarsal bones by slips except talus, base of first and fifth metatarsal bones. Tibialis posterior tendon deep and superficial tendon of peroneus longus tendon crosses like ‘x’. Nerves of sole are branches of tibial nerve. Medial and lateral plantar nerves are nerves of sole. Both nerves runs along with medial and lateral plantar arteries which are branches of posterior tibial artery. It is a branch of tibial nerve. Medial plantar artery present on medial aspect of it. 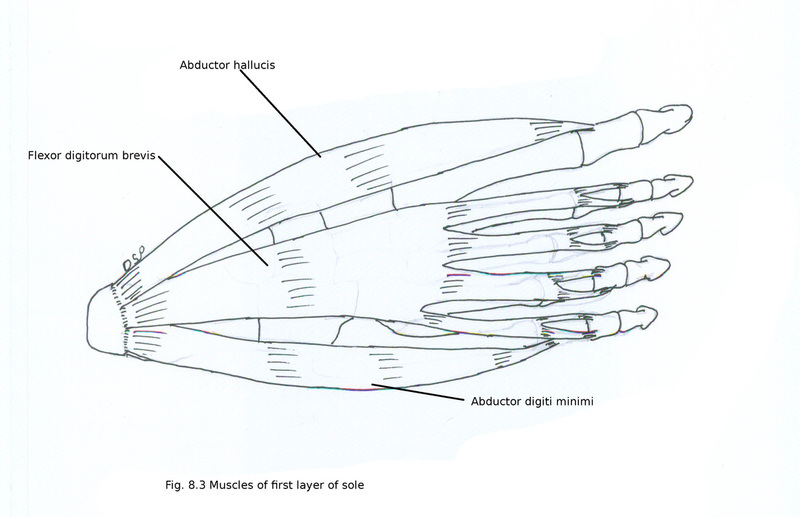 Then it passes forward between abductor hallucis and flexor digitorum brevis also supply it. Then it gives out proper digital nerve on medial aspect of big toe and three common plantar digital nerves. 1) Proper digital nerve : Digital nerve on medial aspect of great toe gives muscular branch to flexor hallucis brevis and digital branch to medial aspect of great toe. 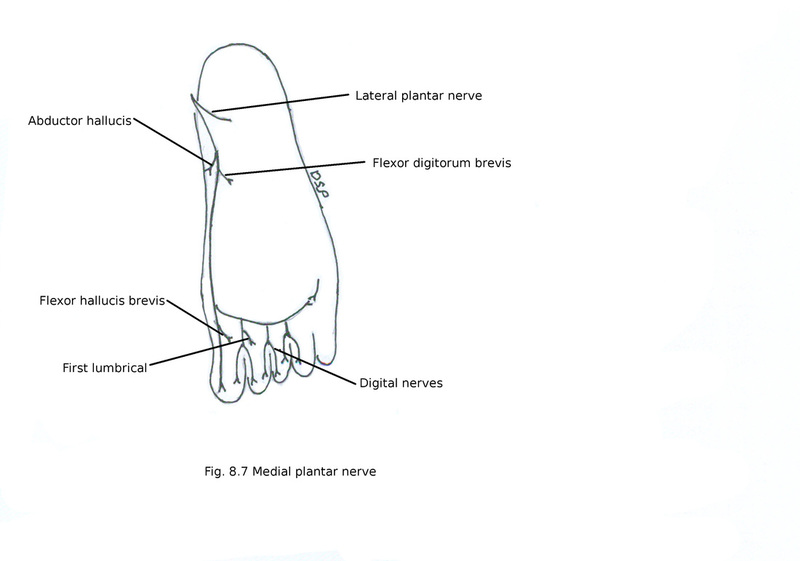 2) Common digital nerves : After passing forward divides into two plantar digital nerves. First digital nerve supply skin of adjacent sides great and second toe and a muscular branch to first lumbrical. Second digital nerve supply skin of adjacent sides of second and third toes. Third digital nerve supply skin of adjacent sides of third and fourth toes and joins with a branch from superficial division of lateral plantar nerve. From main trunk : Abductor hallucis and Flexor digitorum brevis from main trunk. Flexor hallucis brevis from first digital nerve and first lumbrical second digital nerve. Cutaneous branches to skin of sole for medial three and half toes, medial part of sole, dorsum of terminal phalanx. It gives articular branches tarsometatarsal, metatarsophalangeal and interphalangeal joints. It is a smaller branch of tibial nerve. Lateral plantar artery present on lateral aspect of it. Then it passes forward deep to abductor hallucis. Then it passes forward and laterally to the base of fifth metatarsal bone between first and second layer of muscles. Here it supply flexor digitorum accessorius and abductor digiti minimi. After passing between flexor digitorum brevis and abductor digiti minimi divides into superficial and deep branches. It gives out two digital nerves medial and lateral. Lateral branch supply lateral side of little toe. Gives muscular branches to flexor digiti minimi brevis, third plantar interosseous muscle and fourth dorsal interosseous muscle. Medial branch divides into two branches to supply skin of adjacent sides of fourth and fifth toes and communicate with medial plantar nerve. It passes forward and medially between third and fourth layer of sole. It supply both heads of adductor hallucis, second to fourth lumbrical muscles and all dorsal and plantar interosseous muscles except third plantar interosseous muscle and fourth dorsal interosseous muscle. From main trunk : Abductor digiti minimi and Flexor digitorum accessorius. Cutaneous branches to skin of lateral margin of sole, for lateral one and half toes. It gives articular branches intertarsal, tarsometatarsal, metatarsophalangeal and interphalangeal joints. In sole these are terminal branches of posterior tibial artery. It is a small branch of posterior tibial artery. It enters sole after passing deep to abductor hallucis along with medial plantar nerve on its lateral side. On medial side of great toe it gives following two branches : 1) passes along medial side of great toe to anastomose with digital branch of first plantar metatarsal artery. 2) superficial branch divides into three superficial digital branches to anastomose with first, second, third plantar metatarsal arteries. It is large branch of posterior tibial artery. It enters sole after passing between first and second layers of muscles of sole along with lateral plantar nerve on its medial side. Here trunk supply adjacent muscles and gives small cutaneous branches. Near base of fifth metatarsal bone it gives out superficial and deep branch. 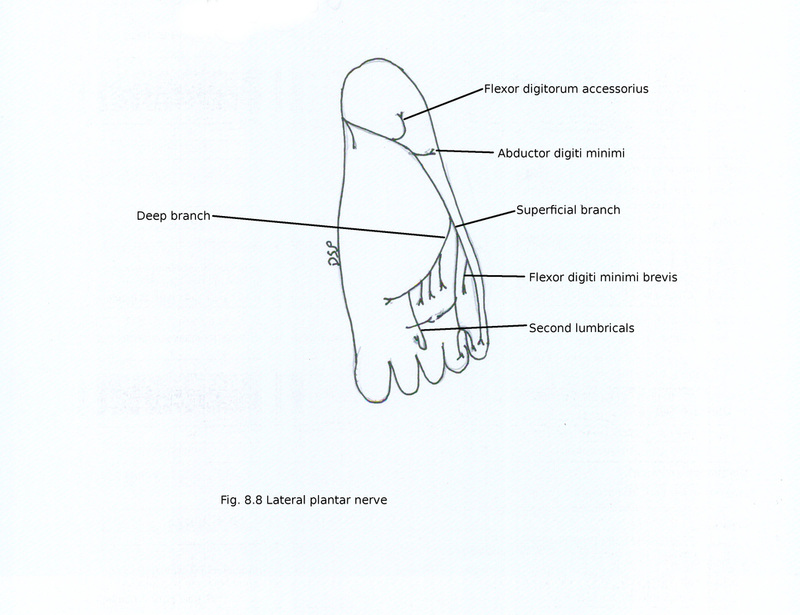 Superficial branch runs along lateral intermuscular septum and supply lateral side of sole, little toe. Then it provide anastomotic branches to join with lateral tarsal artery and arcuate branches of dorsalis pedis artery. Deep branch is continuation of main trunk lies deep to oblique head of adductor hallucis. Forms plantar arterial arch its terminal part anastomose with dorsalis pedis artery after passing between two heads of first dorsal interosseous muscle. Plantar arch lies in between 3rd and 4th layers of muscles of sole and near bases of 4th, 3rd and 2nd metatarsal bones. They go up through space between heads of second, third and fourth dorsal interosseous muscles and anastomose with corresponding dorsal metatarsal arteries. 2) Four plantar metatarsal arteries : They runs anteriorly in intermetatarsal spaces. Each divides into two plantar digital arteries near digital cleft. 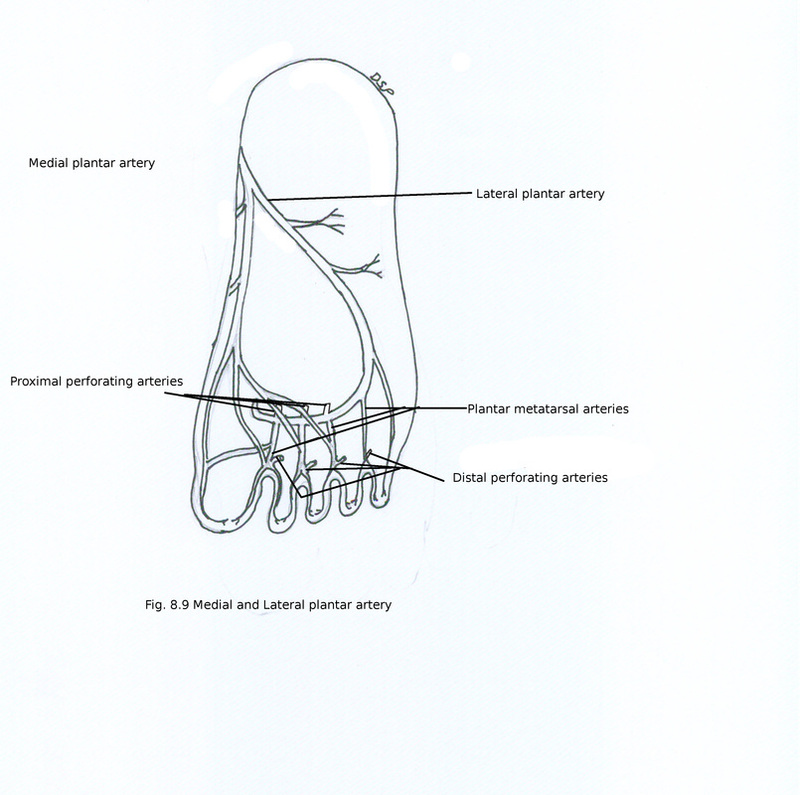 Near metatarsal head each plantar metatarsal artery gives a distal perforating artery dorsally to anastomose with corresponding dorsal metatarsal artery. First plantar metatarsal artery gives a digital branch on medial side of great toe.